The first generation of Ford's voice-activated car control system, Sync, recognized some 100 commands. The new version, beefed up with tech from voice-recognition company Nuance, recognizes over 10,000. Basically, your new Ford just became a way better listener. 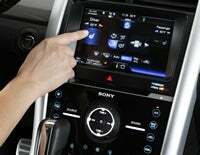 The improved voice recognition comes as part of the new MyFord Touch system, which will be available in the 2011 Ford Edge. The expanded range of commands, in addition to enhanced voice-recognition capability, should make it much easier for drivers to get used to chatting it up with their vehicle. Whereas you used to have to say, "PHONE: DIAL JOHN SMITH," like you were talking to a robot, the new system lets you just say "Call John Smith," like you're talking a person who lives inside your car and just sounds like a robot. Is This How Car Makers Think We Talk?